La Sucursal del Cielo (English:Branch of Heaven)"
Motto: Ave María Santísima, sin pecado concebida, en el primer instante de su ser natural. 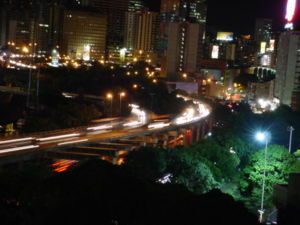 Caracas ( pron. IPA [ka'ɾakas]) is the capital of Venezuela. It is located in the north of the country, following the contours of a narrow mountain valley located on the Venezuelan coastal range (Cordillera de la Costa). The valley's temperatures are springlike, and the urbanizable terrain of the Caracas Valley lies between 2,500 and 3,000 ft (760 and 910 m) above sea level. The Valley is close to the Caribbean Sea , separated from the coast by a steep mountain range ( Cerro Ávila) that rises above 7400 ft (2200 m); to the south lies further hills and mountains. 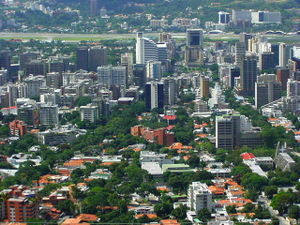 The historic centre of Caracas, known as the Libertador District, had an estimated population of 2.1 million in 2005. In that same year, the official metropolitan area had an estimated population of 3.3 million. 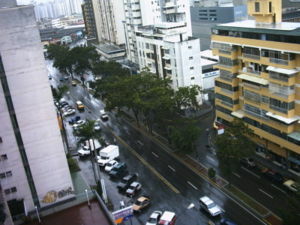 Distrito Capital (Capital District) is the name of Caracas' primary seat, covering part of Miranda State. The population of Caracas' urban agglomeration (Greater Caracas, including neighboring cities out of the Capital District) is about 4.7 million. More than five hundred years ago, the area was populated by peaceful local ethnic tribes and Caracas did not exist. Years went by, and Francisco Fajardo, a Spanish colonizer founded a plantation there in 1562. Fajardo's stay in the valley did not last long, and he was expelled by the locals who returned to their flower-filled freedom. This was the last rebellion on the part of the aborigines, for on July 25, 1567, the Spanish captain Diego de Losada laid the foundations of the city of Santiago de León de Caracas, and the ethnic settlement of Catuchacao became transformed under the influence of the colonizers into the new city of Caracas. 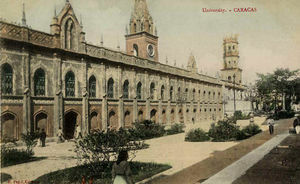 The cultivation of cocoa stimulated the development of the city which became the capital of the province of Venezuela. An attempt at revolution to gain independence organized by José María España and Manuel Gual was put down on July 13, 1797. But the ideas of the French Revolution and the American Wars of Independence inspired the people, and on July 5, 1811 a Declaration of Independence was signed in Caracas. This city was the birthplace of two of Latin America's most important figures: Francisco de Miranda and "El Libertador" Simón Bolívar. An earthquake destroyed Caracas on March 26, 1812 and was portrayed by authorities as a divine punishment for rebelling against the Spanish Crown, during the Venezuelan War of Independence. The valley became a cemetery, and the war continued until June 24, 1821, when Bolívar gained a decisive victory over the Royalists at Carabobo. 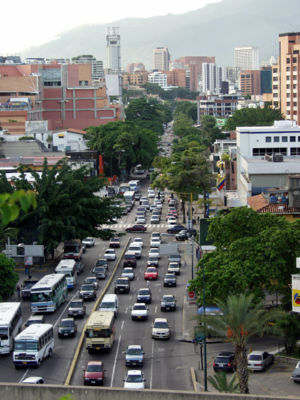 As the economy of oil-rich Venezuela grew steadily during the first part of the 20th century, Caracas became one of Latin America's economic centers, and was also known as the preferred hub between Europe and South America. During the 1950s Caracas began an intensive modernization program which continued through the 1960s and early 1970s. 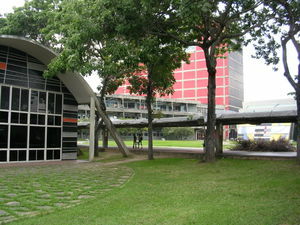 The Universidad Central de Venezuela, designed by modernist architect Carlos Raúl Villanueva, now a UNESCO monument, was built. Joining El Silencio, also by Villanueva, several workers' (23 de Enero, Simon Rodriguez) and new middle class residential districts (Bello Monte, Los Palos Grandes, Chuao, Cafetal, etc.) sprouted in the valley, extending its limits towards the East and South East. 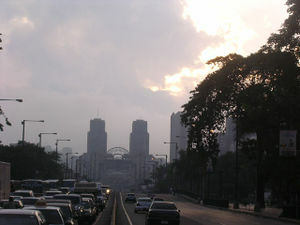 On October 17, 2004, one of the Parque Central towers caught fire. The change in the economic structure of the country, now oil dependent, and the fast development of Caracas made it a magnet for the rural communities who migrated to the capital city in an unplanned fashion, creating the 'ranchitos' (slum) belt in the valley of Caracas. Reference: The history and geography of a valley, by Maurice Wiesenthal, article appeared in the book Caracas, published in 1981. The flag of Caracas consists of a burgundy red field with the version of the Coat of Arms of the City effective since the decade of 1980. The red field symbolizes the blood spilled by Caraquenian people in favour of Independence and the highest Ideals of the Venezuelan Nation. Later, in 1994, presumably as a result of the change of municipal authorities, it was decided to increase the size of the Caracas coat of arms and move it to the centre of the field. This version of the flag is still in use today. The coat of arms of the City of Caracas was adopted by the Libertador Municipality to identify itself. Later, the Metropolitan Mayor Office assumed the lion, the scallop and the St. James Cross for the same purpose. The anthem of the City is the Marcha a Caracas by the composer Tiero Pezzuti de Matteis with lyrics by José Enrique Sarabia. The lyrics are said to be inspired by the heroism of the Caracas people, and the memory of the City of Red Roofs. Caracas has five municipalities: Baruta, El Hatillo, Chacao, Libertador and Sucre. The constitution of Venezuela specifies that municipal governments be divided into executive and legislative branches. The executive government of the municipality is governed by the mayor, while the legislative government is managed by the Municipal council. In March 8, 2000, the year after a new constitution was introduced in Venezuela, it was decreed in Gaceta Oficial N° 36,906 that the Metropolitan District of Caracas would be created, and that some of the powers of these municipalities would be delegated to the Alcaldía Mayor, physically located in Libertador municipality. 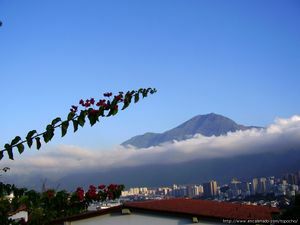 Caracas is located in a valley, urban development in the last century has expanded to the adjacents mountains. The main water body of Caracas is the Guaire river, which flows across the city. In the north side of the city is located the mountain Cerro El Ávila. 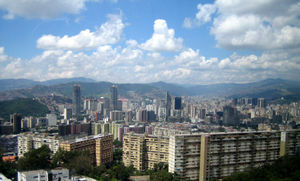 Caracas as the capital of Venezuela, hosts numerous companies of services, banks, malls, among others. Its activity is in almost 100% of services, excepting some industries established in its metropolitan area, this city also host the Caracas Stock Exchange, that requests the operations of the purchase and authorizes the sale of the instruments for its negotiation in the stock-market. It also hosts Petróleos de Venezuela (PDVSA) which is the main company of the country, that negotiates all the international agreements for the distribution and export of petroleum. The population of Caracas is of 3,276,000 inhabitants, not including the sorrounding suburbs, like Petare, whose population might get up to 1,500,000 people. The mixture of races and cultures has marked this city throughout its history. Previously, during colonial times, spaniards mixed with local native indians and again with African slaves brought to work on the cocoa and coffee fields, thus, as a result, it is possible to see any kind of mixture of these races nowadays in the city. After this colonization period, when Venezuela was already independent and when petroleum was discovered and exploited, another kind of immigration arrived in the growing city: Europeans. The French, who brought the phone system (thus, people say "aló" like in French, when they answer the phone), and the Dutch (Shell Petroleum), who came to exploit the natural resources. Then afterwards, due to the Second World War, old European dictatorships and more exploitation of petroleum, many thousands of immigrants from Spain (Galicia, Canary Islands especially), Portugal (Madeira Island especially), Italy and some other countries like Turkey and Lebanon came to build a new life on a brand new city, about to burst. This European immigration was notorious during the 60s and 70s. But some years later, during the 80s and 90s, Caracas received another type of immigrants, this time from nearby countries such as Colombia; Ecuador; Peru, Bolivia, Trinidad and Tobago, Haití, bringing again a new type of demography to the former landscape. Fortunately, due to the old Spanish influence, mixture of races and cultures has been an accepted part of life in the city of Caracas. Therefore, it is not difficult to find blond people with dark eyes, as well as very dark people with blondish hair and blue eyes. Nevertheless, the common demography would be "mulatos" (black+white), "mestizos" (white+native indian), and "criollo" (three races all together). Nowadays, due to the new petroleum boom, and new immigration policies, Caracas is receiving immigrants who come now from Cuba, China and Arabic Countries like Iraq and Iran. This new immigration has a lot to do with the new alliance made by the current President Hugo Chávez with the above mentioned countries. As you can see, many people have arrived, but unfortunately the city has grown without any control. No demographic planning has ever been done, thus it is totally normal to find many and many zones and neighborhoods of Caracas without water and electrical systems, not to mention other services like schools, hospitals, police, fire departments, etc. Therefore, many suburbs and zones of the city are like lawless territories, in which crime and insecurity is felt every day and every night. 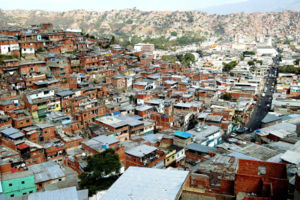 Caracas, like many other Latin American cities, represents the best example of "non-planned supportable development", having as a result a modern, rich city, but at the same time, lawlessness combined with lots of misery and poverty. It is quite normal to find in Caracas an amazing 60-story, magnificent, high-tech building right next to a small house. 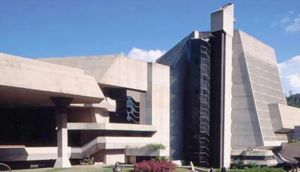 The main campus of the Central University of Venezuela, designed by the renowned architect Carlos Raúl Villanueva and declared World Heritage by UNESCO in 2000, is considered to be a masterwork of Modern Architecture and Art. Over 28 artists from the Modern Avant-garde participated in the project. Among them Hans Arp, Alexander Calder, Fernand Léger, Victor Vasarely with the Venezuelans Francisco Narváez, Alejandro Otero and Oswaldo Vigas. The Capitolio Federal occupies an entire city block, and, with its golden domes and neoclassical pediments, can seem even bigger. The building was commissioned by Antonio Guzmán Blanco in the 1870s, and is most famous for its Salón Elíptico, an oval hall with a mural-covered dome and walls lined with portraits of the country's great and good. Visit on Independence Day and you'll catch a glimpse of the original Act of Independence of 1811, installed inside a pedestal topped by a bust of Bolívar and displayed only on this most auspicious of public days. The halls surrounding the salon are daubed with battle scenes commemorating Venezuela's fight for independence. Designed by Brazilian architect Roberto Burle Marx. A green paradise in the middle of the city, where diverse activities can be done. A park where typical animals can be seen in a little zoo. A replica of the famous ship led by Christopher Columbus, la Santa Maria, is in the southern part of the park. The Teresa Carreño Cultural Complex (Complejo Cultural Teresa Carreño), or more commonly the Teresa Carreño Theatre (Teatro Teresa Carreño), is one of the most important Theaters of Caracas and Venezuela, where symphonic and popular concerts imagine frequently, operas, ballet and theatre. It is located near the Seat of the museums, the Caobos Park and the Athenian of Caracas,in the cultural zone of the city. It is divided in two rooms: Jose Felix Ribas and Ríos Reyna. It is constructed on a land of 22 thousand square meters. The theater was thus called in honour to the pianist Teresa Carreño. Skyscrapers may loom overhead, but there's more than a hint of original colonial flavor in this neatly proportioned reconstruction of the house where Simón Bolívar was born on July 24, 1783. The museum's exhibits include period weapons, banners and uniforms. Much of the original colonial interior has been replaced by monumental paintings of battle scenes, but more personal relics can be seen in the nearby Museo Bolivariano. Pride of place goes to the coffin in which Bolívar's remains were brought from Colombia; his ashes now rest in the National Pantheon. 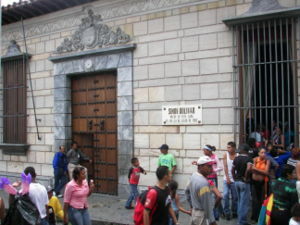 Bolívar's funeral was held 12 years after his death at the Iglesia de San Francisco, just a few blocks west, and it was also here that he was proclaimed 'El Libertador' in 1813. The church dazzles the eye with its richly gilded baroque altarpieces, and still retains much of its original colonial interior, despite being given a modernizing once-over by Guzmán Blanco. The gardens that surround this museum are almost as enticing as its interior. The museum is housed in a gorgeous colonial country mansion known as Quinta Anauco, which is surrounded by beautiful greenery. Inside the house you'll find meticulously restored rooms, filled with carefully selected works of art, furniture and period household and many other historical artifacts. Venezuela's most venerated building is five blocks north of Plaza Bolívar, on the northern edge of the old town. 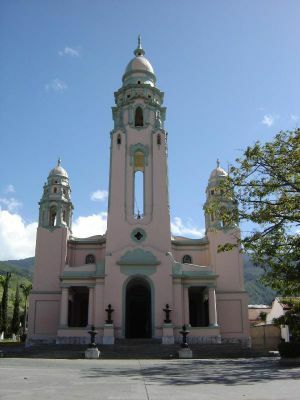 Formerly a church, the building was given its new purpose as the final resting place for eminent Venezuelans by Antonio Guzmán Blanco in 1874. The entire central nave is dedicated to Bolívar, with the altar's place taken by the hero's bronze sarcophagus, while lesser luminaries are relegated to the aisles. The national pantheon's vault is covered with 1930s paintings depicting scenes from Bolívar's life, and the huge crystal chandelier glittering overhead was installed in 1883 on the centennial of his birth. It's worth hanging around to catch the ceremonial changing of the guard, held several times a day. At a short saunter east of Plaza Bolívar is Parque Central, a concrete complex of five high-rise residential slabs of somewhat apocalyptic-appearing architecture, crowned by two 53-storey octagonal towers while one of them is currently going under major repairs due to the fire which burned the building on October 17, 2004. Parque Central is Caracas' art and culture hub, loaded with museums, cinemas, the Teresa Carreño Cultural Complex, and the Caracas Athenaeum, home to the esteemed Rajatabla theatre company. The Mirador de la Torre Oeste, on the 52nd floor, gives a 360° bird's-eye view of the city. Leafy Plaza Bolívar is the focus of the old town with the inevitable monument to El Libertador, Simon Bolívar, at its heart. Modern high-rise buildings have overpowered much of the colonial flavor of Caracas' founding neighbourhood. But the lively area still boasts some important sites. The Museo Caracas on the ground floor highlights local history, and has some great models of the city as it appeared in the early 19th century and 1930s. To grasp just how much this city has grown, take a look at the map dating from 1578 in the building's central courtyard. El Hatillo is a colonial town located at the south-east suburbs of Caracas in the municipal area of the same name. This small town, which is one of Venezuela's few well-preserved typical colonial areas, gives an idea of what Caracas was like in centuries past. Just like every town in Venezuela, El Hatillo has its own Plaza Bolívar with El Libertador's statue in the middle. It also has a well preserved Roman Catholic Church, and many colonial houses. Even the municipal government, banks, and bookshops in this neighbourhood keep the colonial look, with tall windows, floor-to-top wood doors, and red tile roofs. The actual colonial section of El Hatillo municipality represents only a small part of the total land size. 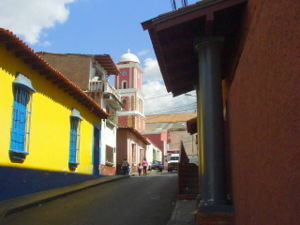 Other parts of El Hatillo municipality are regular residential and commercial zones, including the neighborhoods of La Boyera, Oripoto, and La Lagunita. Cerro El Ávila (Mountain El Ávila) (Wuaraira Repano), is a mountain in the mid-North of Venezuela, it rises next to Caracas and separates the city from the Caribbean Sea, it is considered the lung of Caracas due to the fact that there is no construction on it, only vegetation, this makes it a sites of reference of the city. In 1958 the mountain was declared National Park, with the name of El Ávila National Park. For those who wish to know the most commercial and cosmopolitan district of Caracas, you must visit Las Mercedes, this zone reunited some of the best restaurants of the city, that include the diverse gastronomical specialities, along with pleasant pubs, bars and pools. It is the favorite meeting place of the Caracas youth, it has some of the most exclusive stores of the city. Altamira is a neighbourhood located in the Chacao municipality of Caracas, it has its own Metro Station, many hotels and restaurants, and is an important business centre of the city, the Francisco de Miranda avenue (a major avenue in Caracas) and the Distibuidor Altamira (a congested highway exit) are both located in Altamira. 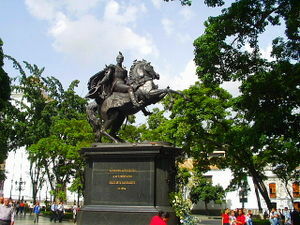 The Cathedral is situated in one corner of the Plaza Bolívar, it was founded in 1594. The parents of Simón Bolívar are buried in the Cathedral, besides its hand carved altars, it possesses some magnificent works of art, a Resurrection by Rubens, the Presentation of the Virgin by Murillo, and the Last Supper, an unfinished work by the Venezuelan painter Arturo Michelena. 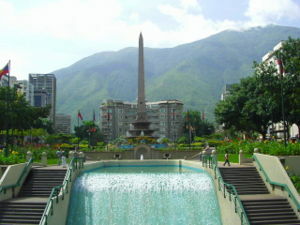 Caracas is home for some of the most prestigious universities in the country, including Universidad Central de Venezuela, Universidad Simón Bolívar, Universidad Católica Andrés Bello, Universidad Metropolitana, Universidad José María Vargas and several others. Most notably football and baseball teams are located in Caracas. Several other sports also have Caracas as their home. The baseball teams Tiburones de La Guaira and Leones del Caracas have like seat the Estadio Olímpico de la UCV, of the Central University of Venezuela, with a capacity of 25.000 spectators. The Navegantes del Magallanes, another baseball team, although it was founded in Caracas, was moved to Valencia, Carabobo, but it has a great liking in the capital, in special by its historical rivalry with the local team. Brígido Iriarte stadium, with a capacity of 12.000 spectators (old seat of the Caracas Fútbol Club and Deportivo Italchacao). The Caracas Football Club opens its own stadium in August 2005, called Cocodrilos Sport Park. Caracas for being the capital of Venezuela, has the seat of the National Institute of Sports and the Venezuelan Olympic Committee as well as of many clubs and national federations of a great diversity of disciplines. Caracas is Venezuela's cultural capital, boasting several restaurants, theaters, museums, and shopping centers. The city is also home to an array of immigrants from but not limited to: Spain, Italy, Portugal, the Middle East, Germany, China, and Latin American countries. The city has two main football stadiums: The Olympic Stadium (35,000) and the Estadio Brígido Iriarte, with a capacity of 25,000 seats, which is home to the Caracas Fútbol Club and Italchacao). Baseball teams Tiburones de la Guaira and Leones del Caracas also play on their shared stadium Estadio Universitario (33,000 seats). 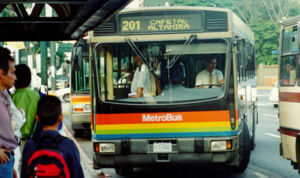 The Caracas metro has been in operation since 1983 and is the safest and quickest way to travel in the city. It is the pride of Caracas because of its functionality and cleanliness. 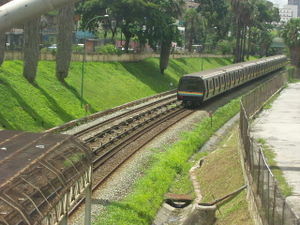 With four lines and more than 40 stations, it covers a great part of the city, it also has an integrated ticket system, that combines the route of the Metro with those offered by the Metrobús, a bus service of the Caracas Metro, that arrives at zones with the same quality and excellence. The Metro system works from 5:30 a.m. to 11:00 p.m. The Simón Bolívar International Airport, the biggest and most important airport in the country is located outside the city, roughly 20 miles from the Downtown. Taxis and Buses are available at the airport to provide transportation to the city.